A bicyclist chats at a pit stop at last year’s Bike to Work Day in Raleigh, NC. Photo contributed by BikeRaleigh. All month long, communities around the US have been celebrating National Bike Month 2018. May is halfway through, but there are dozens of bicycling events happening around North Carolina that are still to come — including this Friday’s Bike to Work Day in Raleigh, NC. If you’ve never tried out a bike route to work, National Bike to Work Day is a great day to explore your options and meet other bicycling enthusiasts. Commuting with a bike can help you save money on gas, avoid traffic, get exercise, and be more environmentally friendly by not contributing to air pollution. Fontaine Burruss, Bikeshare Coordinator for City of Raleigh Department of Transportation, said Raleigh’s Bike to Work Day event is for anyone from longtime bicycle commuters to those who are trying it for the first time. “It’s a great way to both celebrate those who bike to work already, and also encourage people who are in interested in biking to work but maybe haven’t taken that leap,” Burruss said. 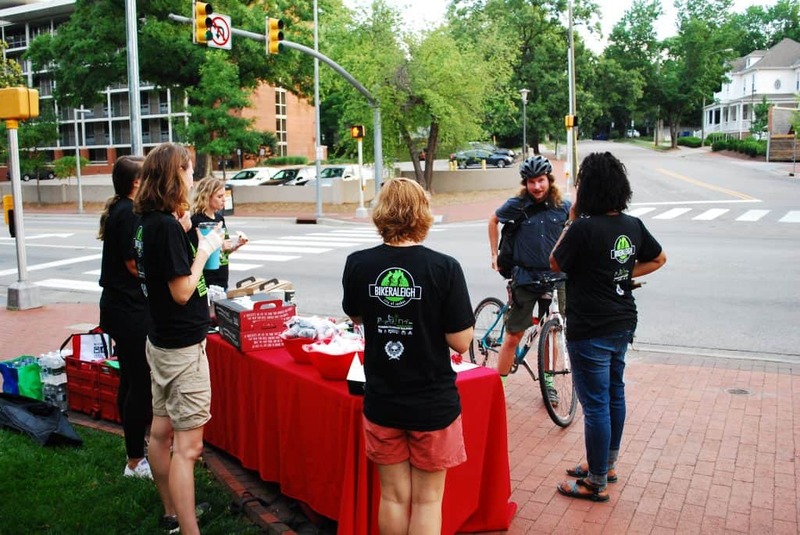 The City of Raleigh’s Bike to Work Day event will be throughout the morning and evening this Friday, May 18, with pit stops located around the city packed with refreshments and giveaways. 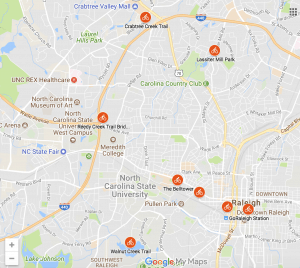 Most pit stops will be around in the morning, ranging from 6 to 11 a.m., with one pit stop after work from 4 to 6 p.m.
To find the map of pit stops in Raleigh, view below (pit stops are indicated by the orange bicycle symbols) and click here for the interactive version complete with hosts and times they will be there. You can also map out your route and view bike lanes by using Raleigh’s online bike map or downloading BikeRaleigh’s free mobile app. Raleigh’s Bike to Work Day is a one-day event, but Burress said she hopes it makes a lasting change in people’s lives. “Often what we find is people who try it once realize it’s not as hard as they think it is to bike to work, and they’re open to trying more often,” Burress said. 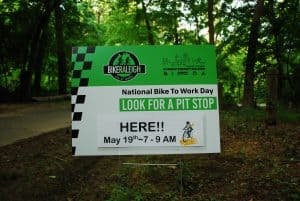 If you can’t make it out Friday, Durham County will also have a Bike to Work Day event next Thursday, May 24, with several pit stops located throughout the city from 7:30 to 9:30 a.m. Stop on your way to work for food and prizes; and for each location you stop, you also get entered into a raffle. If you’re new to commuting, Durham County has a Bike Buddy program, where a partner can help show the way. View the Durham event map here and visit www.bikedurham.org for more information. There are plenty of more National Bike Month events happening around North Carolina in May. For more in Raleigh, Durham, Carrboro, Cary, Chapel Hill, Hillsborough, Knightdale and Wake Forest, visit gotriangle.org. For events in Asheville, Hendersonville, Waynesville and Black Mountain, visit strivenottodrive.org. Before you go, be sure to check NC Department of Transportation Division of Bicycle and Pedestrian Transportation’s safety and education page to be aware of laws and safety measures when it comes to bicycling in the city.